Looking for a gift for a Melbourne parent? Or perhaps even a treat for yourself, which will not only benefit you, but the whole family? If so, consider purchasing the newest edition of Small Ideas. Small Ideas is a voucher book with a difference. Carefully researched and put together by Melbourne Mum Belinda Small, Small Ideas, now in its 4th published year, offers Melbourne parents discounts, freebees and 2-for-1 deals for child related places, shops and activities in Victoria's capital city. - Junglemania Playcentre, Deer Park Hotel, and Paul Sandler Swimming in the West. - Billy Lids Playcentre, Templestow Hotel and Kinder Ballet in the East. - United Cinemas Craigieburn, Crafty Cafe and The Tiny Chef in the North. - Dingley Village Adventure Golf, Oscars Hangout and BJ Cakes & Parties in the South East. - ArtVo, Sea Life Aquarium, Play Central and Luna Park in Inner Melbourne. - Boneo Maze, Dinosaur World, and The Moonlit Sanctuary on the Mornington Peninsula. - Airo Drome Trampoline Park, Jirrahlinga Koala & Wildlife Sanctuary and The Carousel in Geelong and the Bellarine Peninsula. - Ballarat Wildlife Park, Kryal Castle and Sovereign Hill in Ballarat. The aforementioned is just a handful of places and activities where you can redeem your Small Ideas vouchers. From restaurants to mini golf, music classes to aquatic centres, Small Ideas makes family trips out in Melbourne that bit more affordable. If you are a Melbourne family who loves to get out and explore the amazing things to do and try out in this fine city, Small Ideas is well worth the investment. Likewise, if you know a Melbourne family who might benefit from a discount or (hundreds) more, a Small Ideas book would be a great gift. 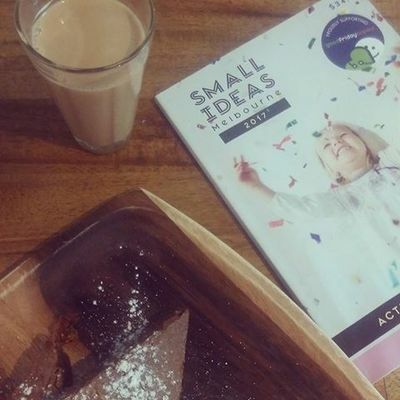 Small Ideas 2017 activity voucher book is out now, priced at a reasonable $34.95. If you are part of a fundraising committee, consider using Small Ideas 2017 as a fundraiser for your day care centre, kinder, playgroup or primary school. You can raise $9.95 for every Small Ideas book sold as part of a fundraiser. Small Ideas also supports The Good Friday Appeal.